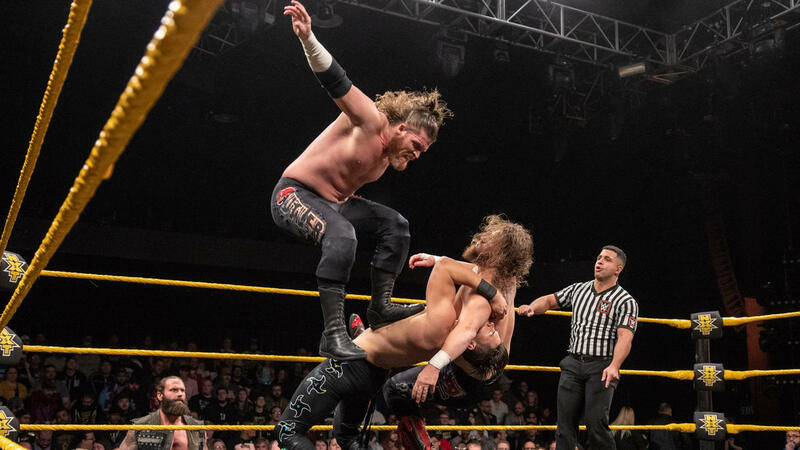 Welcome one and all to another installment of the NXT Spotlight here at TJRWrestling. The calendar has turned to December and as 2018 comes to a close, we still have some red hot rivalries that have gone the course of the year, and don’t look like they’re coming to a close any time soon. We’re back in Full Sail now, and as we head to Phoenix for the next Takeover show, let’s see what the show has in store for us tonight. I don’t know as much about Riddle as some, but it’s undeniable how much he relates to the crowd. Full Sail is going nuts for him. 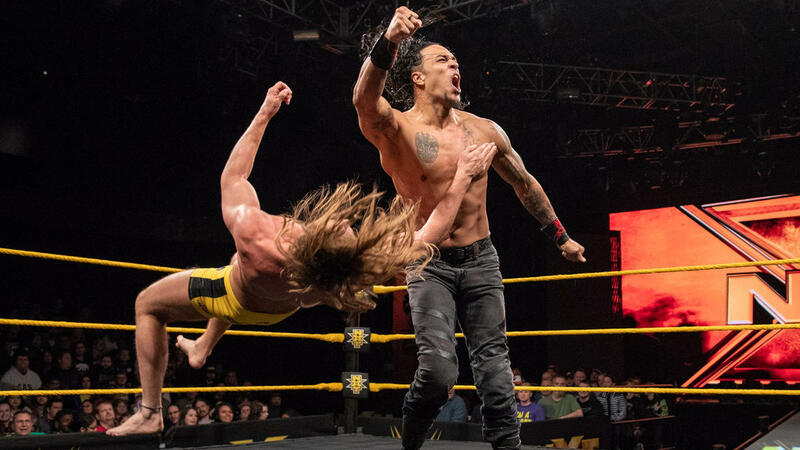 This is the debut for the newly signed Punishment Martinez. This guy was fantastic in Ring of Honor. Good reaction for him. He’s got great theme music. Surprised they didn’t make him change his name, but glad they didn’t. Strong tie up to start. Martinez gets baited in by Riddle, who hops on the back of him with a sleeper hold, but Martinez drops him backwards. Riddle lands hard, but sits up to hook it back on. Martinez with a nice roll through to escape and then a big right hand. He goes for a back elbow in the corner, but Riddle moves out of the way and multiple kicks in the corner. Big flying burrito forearm in the corner. He goes for another one but Martinez comes at him with a cyclone kick for a two count. Martinez lands the running back elbow in the corner this time. Riddle comes back with an open hand chop. Martinez comes back from that with a huge clothesline. Riddle with palm strikes, but Martinez tries to hook a chokeslam. Riddle kicks his way out, ducks a clothesline, and then hits a big kick to the side of Martinez’s face. Riddle knocks Martinez down and and goes for the Bromission. Martinez fights it off, but Riddle with rapid slaps to the chest, which opens Martinez up, and this time it’s locked on and Martinez has to tap out. Post match, Riddle makes his way up the ramp to celebrate, but Kassius Ohno shows up behind him. Riddle turns around and walks right into a rolling elbow from Ohno that knocks Riddle off the stage. Ohno is happy with his work as Riddle tries to recover. K-Tank’s Take: So the Ohno/Riddle feud will obviously continue. Ohno has been much better as of last, now that he has a direction, so no complaints with me. I don’t like Martinez tapping out already, but they can keep him off TV for a while and bring him back when no one will remember he tapped out. I saw him live the night he won the Ring of Honor TV Title and he’s got an undeniable presence about him. I like the way he moves for a guy his side. I think he’s got a ton of potential, but this roster is so stacked now, so it might be a while before we notice it. After a video package hyping up Ricochet, we go to him outside Full Sail with the media. 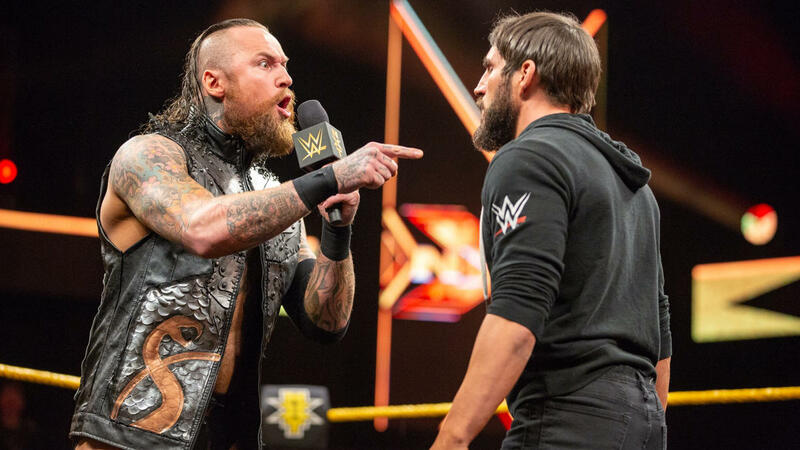 He says he enjoys being the highlight reel of NXT but he also enjoys defending his title and so he’s going to Regal’s office right now to talk about defending his title next week on NXT and who Regal might have in mind to be the challenger. Now we get a video package for Heavy Machinery, who talk about having a tag title match a year and half ago, and learning from that experience. Now they’re ready for Undisputed Era because their journey isn’t over until they win the tag titles. We get a note from William Regal that in 3 weeks there will be a fatal 4 way to determine the new #1 contender for the NXT Women’s title. The first participant is Bianca Belair, who earned her spot by winning a match at an NXT live event last weekend. It’s Cutler and Blake again for the Sons. Cutler doesn’t have his face mask anymore. Cutler and Mendoza start the match. Mendoza escapes a side headlock and shows off his quickness while landing a step up einziguri. Carillo tags in and they hit a double team hiptoss and then a cool looking double team move that ends with Carillo splashing Cutler on the mat. Carillo with a wrist lock, but Cutler gets him to his corner and Blake tags in. Blake with a loud chop and then trash talks Carillo in the corner. Another loud chop. Carillo avoids Blake in the corner and then hits an enziguri of his own. Mendoza tags in and hits a nice springboard hurricanrana on Cutler who came into the ring. They try Poetry in Motion on Blake, but Blake catches Mendoza and slams him down on Carillo. Blake now works over Mendoza and then tags in Cutler, which leads to a double team backbreaker. Cutler with knees to the spine of Mendoza, followed by a slingshot backbreaker. Mendoza escapes the attack with a back suplex and manages to tag in Carillo. Blake tags in too and Carillo comes off the top rope with a cross body. Handspring back elbow by Carillo and then a fantastic high arm drag off the top rope to Cutler that sends him to the floor. Carillo gets some serious air with a missile dropkick to Blake. Carillo follows up with a rolling moonsault, but Cutler breaks up the pin. Mendoza throws Cutler to the floor and goes for a dive but Cutler just throws him to the floor. The Sons manage to cut off Carillo and they set up for a double team reverse DDT & second rope stomp, and that gets the win. K-Tank’s Take: Carillo and Mendoza looked really good as a team, so I wouldn’t be surprised if this leads to seeing more of them together. I’ve stated how much of a fan I am of the Forgotten Sons, so I’m happy to see them pick up wins. I think they have solid offense and work really well off one another. We go backstage to The Velveteen Dream. His match with Ciampa is brought up, but he cuts it off and snaps his fingers to set the mood properly. He’s asked what is next for the Dream. He says that’s a good question. The people are still talking about the Dream. So is the internet and the NXT roster. People are even asking Triple H about Dream. So as far as he’s concerned, Dream wins. Or, Dream Over. So what’s next? Leaving this interview. He snaps his fingers and everything goes back to normal. Now we go to the Undisputed Era in the back of one of the trailers. Bobby Fish says he needs to correct EC3. He’s not just another guy, but he is the guy that EC3 has been warned about. EC3 needs to ask himself how far is he willing to go into the deep end when he knows those waters are infested with sharks. They’ve bit him once before and they will do it again. Roddy says EC3 thinks they’re playing, but they’re not. Look at how they injured War Raiders at War Games. What teams are left? The Street Profits? The Mighty? Heavy Machinery wants a shot at them? They’ve never faced anyone like Undisputed Era. Adam Cole says they can all keep trying, but this is their Era and that is Undisputed. We now get a report from Mauro Renallo, who says they’ve received a medical update on Hanson after War Games, and he is recovering from broken ribs, a ruptured spleen, and torn ligaments. He will need a few weeks to recover according to Mauro. K-Tank’s Take: Not sure if those injuries are legit for Hanson, but based on the emphasis on Heavy Machinery during this show, I would think they are. Everything was lined up after War Games for War Raiders to continue going after the tag titles and we’ve now taken a left turn and it looks like Heavy Machinery will get a shot first. Looks like it’s to be determined if Hanson will be back in time for them to set something up for Takeover still. Dakota with a big sliding kick and double foot stomp early. Baszler goes to the floor and Dakota goes for a kick from the apron but Baszler catches the leg and slams it into the ringpost. Dakota makes it back to the ring but Baszler goes right to work on the arm of Dakota and sets her up to injure the shoulder like she did a few months ago. Dakota moves at the last minute, but Baszler is able to grab the arm again and snaps it back ala Pentagon Jr. Baszler now starts to taunt Dakota, but Dakota keeps fighting and hits a cool looking back kick and then repeated short kicks to the face of Baszler. Baszler backed into the corner and she gets face washed, followed by a Helluva Kick. Dakota goes for a second but Baszler moves and comes back with a knee strike for a two count. Baszler tries to stay on offense but Dakota catches her with a pump kick. Dakota to the top rope and comes down with the Coup de Grace, but Baszler is able to kick out. Baszler grabs the injured arm of Dakota and manipulates the joints. Dakota backs herself in the corner and climbs up the turnbuckles. She manages to kick Baszler off at first, but Baszler with a step up kick, and then climbs up to bring Dakota crashing down with a gutwrench suplex off the second rope. Both women slow to get up and Dakota kicks away at Baszler’s head. Dakota goes off the ropes but Baszler trips her and then locks on the reverse choke. Dakota is fading fast and barely is able to tap out before passing out. Post match, the Horsewomen gang up on on Dakota. They kick her around until Io Sharai comes out and is able to rid the ring of the Horsewomen. Baszler gets a huge uppercut, which sets her up for a Dakota face wash, but the Horsewomen pull her out of the ring at the last second. K-Tank’s Take: Really good showing from Dakota in this match. I like that there was a story in the match of Dakota learning from her previous experiences against Shayna and not being as scared now. Kairi Sane is battling hand/foot/mouth disease right now, so that’s why it was 3 on 2 at the end. If she’s able to recover quick, this will all lead to a big six woman tag. We get another vignette for Dijakovic. It’s time to Feast Your Eyes. Next week will be EC3 vs. Bobby Fish, along with Ricochet’s North American Title match against a mystery opponent. Aleister Black’s music cuts him off. Black makes his way to the ring with mic in hand. The crowd is strongly behind Black. Ciampa holds his title high. Black says at Takeover, he absolved Gargano from his sins. The sins that Ciampa the puppet master created. Ciampa is not really a champion. Black looks at Ciampa and he sees original sin. Sin that Black will also absolve. Because he’s envoking his NXT Title rematch at Takeover: Phoenix. Johnny Gargano’s music hits and he comes down letting Black know that they’re not done, so he’s jumping the gun asking for a title shot. He appreciates Black absolving him of his sins, but this is over when he says it’s over. Ciampa says he loves when Johnny leaves Johnny Wrestling in the back and comes out as Johnny Badass. The champ knows better than anyone that when Gargano is fixated on something, he won’t let it go, and Gargano is clearly fixated on Black. The champ saw what they did at Takeover, and the only thing that was missing is it should’ve been them two inside a steel structure. So it’s just his opinion that he would want to finish this the right way, once and for all, inside a steel cage. He can tell from both men that they both like the sound of that, and he’s sure that Full Sail wants to see them fight inside a steel cage. The crowd of course reacts favorably. Gargano says he’s not afraid of Black because he’s Johnny freaking Wrestling. Black screams that Johnny Wrestling is dead. He showed Gargano mercy at Takeover, but that’s over now. He will fight him anywhere, even in a parking lot. Gargano asks how that worked last time they were in a parking lot together? He laid up Black for 3 months. Imagine what he’ll do to Black in a steel cage. Black goes for Black Mass, but Gargano rolls out of the ring. Ciampa is smiling at what he’s done from the apron and doesn’t see Black go for Black Mass, which lays the champ out. Gargano acts like he’s not scared of Black as Black stares him down. That ends our show. K-Tank’s Take: Ciampa was absolutely masterful in this promo. He’s my vote for the Johnny Awards best talker of 2018. The way he was able to weave Black and Gargano into a cage match was so much fun to see. Black and Gargano made this a very strong promo all around as everyone came across great. So we have two strong matches to look forward to, and it all looks like a big swan song for Black, as I would expect him to move on after Takeover. That’s it for this week! We’ll be back next week, so until next time… don’t do anything I wouldn’t do, but if you do, name it after me!